I was too optimistic yesterday. I should have known that it was too good to be true and that it wouldn't last. I should have reminded myself that no one opens windows in February thinking that it might just welcome Spring into their home. How could I have been so foolish? In this debut novel, Peter is a simple man who lives by a simple truth--a person gains strength by leaning on his constants. To him, those constants are the factory where he works, the family he loves, and the God who sustains him. But when news of job cuts comes against the backdrop of an unexpected snowstorm, his life becomes filled with far more doubts than certainties. 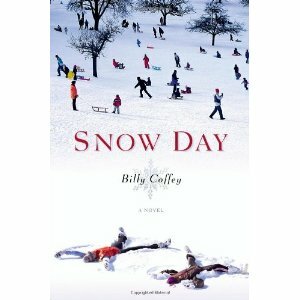 "Set against a Blue Ridge Mountain backdrop, peopled with a colorful cast, and seasoned with small-town Southern charm, Billy Coffey's SNOW DAY will make readers want to live aware--to discover the divine in ordinary places among common folk. Each chapter is a story in itself, a jewel sparkling with wisdom. Strung together, the shimmering strand adorns simple truth: Life may be hard, but God is good. Detours happen by design. One way or another, the road leads home. So pay attention. Laugh. Wonder. And, sweet fancy Moses, don't forget to pick up the bread and milk." ...Maybe God wasn't as concerned about our comfort as we were. Maybe things like trust and faith meant more. Which was why He would allow us a little discomfort sometimes. We would hurt little, yes. But we would learn more. We would learn that when the smooth road we're driving on ends at a cliff, He'll be there to catch us. Knowing that seemed important to me. It was the difference between covering my face in fear and spreading my arms in anticipation. Enjoy the ride. Yes. That was my favourite rule too. And one much easier to obey if I realized that pain had its purpose in my life. That the deeper it bored into my heart, the more room it made for joy later on. There were things like love, for instance. And time. And dreams and hopes and company. We were all rich in those, wealthy beyond measure, but each day we chose to cast all the wealth aside and live in the poverty of worldly gain. What crazy people we were. No wonder the world was so messed up. We had everything backwards. We were all living outside in with the hope that what we surround ourselves with would make us better people. We needed to live inside out with the hope that what came out of us would make the world better....Pay attention. Laugh. Wonder..."
Snow Day is about the author's journey in rediscovering his faith and purpose as he learns to trust in His heavenly Father. I love his writing style and thought-provoking chapters, concluding that God's plans and purposes are always for our good. You can read more of his thoughts over at his blog here. I love how he celebrates Home.